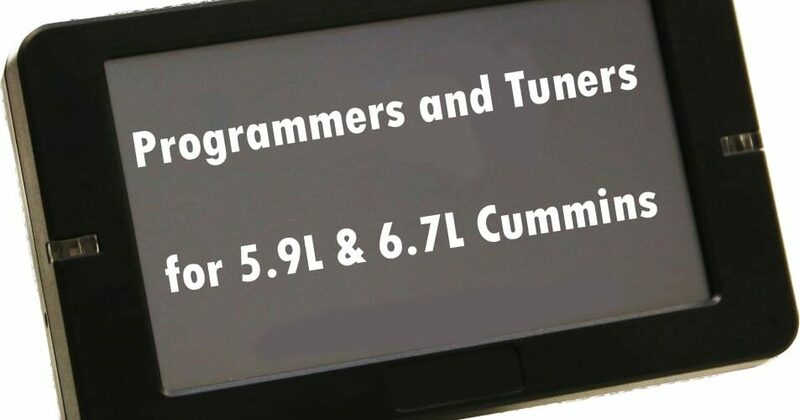 5 Best Programmer for 5.9 Cummins Reviews in April 2019! 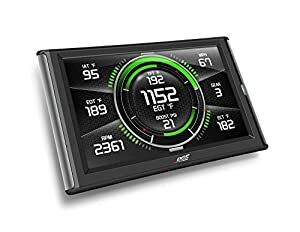 List of Top-Rated Programmers and Tuners for 5.9L Cummins on the Market! Some engines were designed to be the biggest and the best, and the Cummins 5.9L is one such engine. It’s elder brother is the biggest and most powerful of all Dodge Ram engines, boasting a 6.7L capacity. 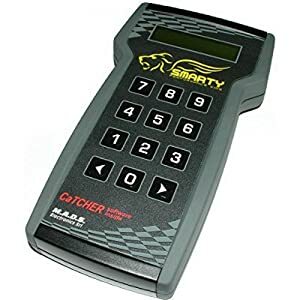 • CaTCHER software with 10 power levels. While both these engines are massive and powerful, with a little tweaking you can coax even more power out of them, and this is where a professional hand-held programmer, tuner, and monitor will give you all the control you need to make your 5.9L or 6.7L engine truly monstrous. These hand-held devices are used to tweak up your engines torque, horsepower, and miles per gallon consumption. This is where tuning comes into play, and these 5 models are the worlds leading tuning devices that will enable you to adjust the mechanical performance of your engines to precise and efficient functioning. 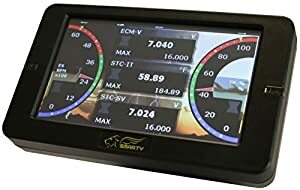 The Smarty Touch is the most advanced tuner on the market and comes with a4 .3″ Touch Display with a resolution of 480 x 272, making it an exceptional screen for easy to read data. This programmer/monitor unit covers all Dodge Cummins Diesel Pickup’s for 1998 to 2018. Essentially, you don’t get better than this model. This is a stand-alone unit and plugs directly into the OBD-II. It has a twin CPU core, making this the world’s fastest display and tuner combination. This model comes with a small micro USB cable connecting the display and the controller for easy installation, and also has a microSD card for fast updates. All updates are free over the internet. The monitor comes with 4 dashboards, and you can configure them with 5 different gauge layouts. It also comes with two configurable alarm settings, high and low. The PID gauges update their data instantly and continuously, and you all recorded max values can be reset. It has selectable performance parameters for fine tuning and provides ABS tire height updates immediately. Smarty Touch leaves NO FOOTPRINT in all 5.9L trucks. Manual High Idle is enabled in all software for CR 5.9L trucks. Programmable Speed Limiter from 25 to 250 mph. TNT-R and SSR software for CR 5.9L trucks (requires to unlock code). RPM and Shift limiters unlocked with TNT-R and SSR software. Power on Demand “PoD” for CR 5.9L and 2007-2009 6.7L trucks. 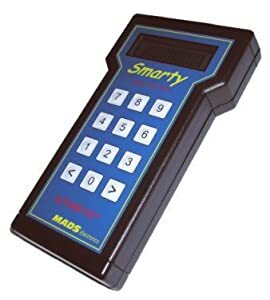 The only device that outsmarts the S-06 Smarty Programmer for the 2003 – 2007 5.9L Cummins, is the new Smarty Touch that we reviewed above. This slightly more budget-friendly device provides you with the same performance levels but with a simpler screen. This device can tweak up your 5.9L Common Rail Cummins, and add a further 30 to 210 Horsepower. This model read your Diagnostic Trouble Codes or DTCs in plain text interpretation and will erase them. It also adjusts your tire height using ABS programming (from 22,5” to 44”) in 1/10” increments, and it doesn’t need tools or fuses to pull. Your engine is manual high idle enabled during all performance levels. This model comes with a convenient keyboard and connects directly to your engine from the OEM hardware. It has a USB connector for quick and easy upgrades of the MADS website and is untraceable. This model includes Power on Demand. This Smarty model is perfect for tweaking up your 5.9L Cummins engines. This basic model will provide you with an extra 35 to 150 Horsepower and is compatible with all Dodge RAM 5.8 L 1998-2002 models. The software comes with 10 different CaTCHER versions to choose from, and it reads and erases your Diagnostic Trouble Codes (DTCs) in plain text interpretation. Just like the other Smarty models, this one also adjusts your tire height using ABS programming (from 22,5” to 44”) in 1/10” increments and operates in manual high idle during all performance levels. Upgrading the software and data is fast and easy over the USB to internet connector. The S-03 is a programmable speed limiter from 25 to 250 MPH and is untraceable. 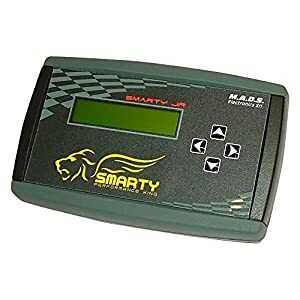 If you own a 2007-2012 6.7L Dodge Cummins pickup, then the Smarty J-67 is the only tool you will ever need to monitor and tweak your engine. It is only bested by its elder brother model the S-67, however, for most drivers, this budget-friendly tool is more than enough. Now we know the 6.7L Cummins is already the most powerful Dodge Ram engine there is. However, it doesn’t hurt to hulk it up a bit, and the J-67 will definitely turn your engine into a green monster. Now, let’s take a look at what this device will do for you. First off you have three different performance levels to choose from: 40, 70, or 100 HP and it will provide you with better fuel economy and optimized drivability. This version will adjust your tire height using ABS programming in just seconds from 22,5” to 44” in 1/10” increments and operates in manual high idle during all performance levels. PoD means you select your preferred power level from 0 to 99. Just to make sure you are secured; the changes will apply only after you release the throttle. You choose from 3 different software levels based on horsepower improvements. Software 1 through Software 3 uses a modified TQM. This improves the throttle response, while your transmission and driveline will be set to safe limits. The Edge Evolution CTS2 provides you with fast and easy reprogramming functions for your vehicle’s stock computer. This device will sit in your cab connected to your OBDII (diagnostic) port. You save the stock files from the ECM and upload Edge calibrations. This model tunes multiple power levels and increases horsepower and torque. It’s stand out feature is that you connect it once, leave it connected and it monitors and re-tunes your vehicle on a constant basis. This model comes with a 5-inch full color, high-resolution, swipe screen that shows gives you a customizable color mixer for gauge arcs, needles, and backgrounds. You also get multiple gauge screen layouts and a one-touch easy menu navigation system. This model is not compatible with 2011 Ram 6.7L manual transmissions and is not legal for use on pollution-controlled vehicles. There is a difference between a standard hot chip/programmer and a preset tuner. The preset tuner makes life easy for you since you don’t need to be a professional mechanic to operate and understand the engines intricacies. A preset tuner has been designed by professionals to be a fast calibration tool. Generally, most tuners do not need too many interface features, a small screen, and a connection is enough. However, the more experienced drivers want to know what is going on in their engine and to control the level of tuning and tweaking. This is where the larger screen models come into play. They provide better monitoring options but essentially provide the same level of tuning as the more basic models. The most important aspects of a tuner are “traceability,” we have picked out the “untraceable” tuners, where there is no fingerprint left behind, which means that these models will leave no trace. When you take your truck in for any reason, you need to reset it to factory default, don’t forget this.